Filed to: PLAGUE INC.Filed to: PLAGUE INC. The stunningly enduring iPhone sensation Plague Inc. may be the video game with the highest body count in the long history of the medium. I’m trying to think of another game that made me feel inadequate for laying waste to a mere 1.75 billion people. We like to pretend that Grand Theft Auto invented the idea of playing as a bad guy, but games have long channeled our more questionable urges. Monopoly tempts you into becoming a heartless landlord willing to bankrupt your friends and turn your neighbors into street people. Risk—and to a lesser extent, Civilization—captures the appeal of becoming a global military dictator. 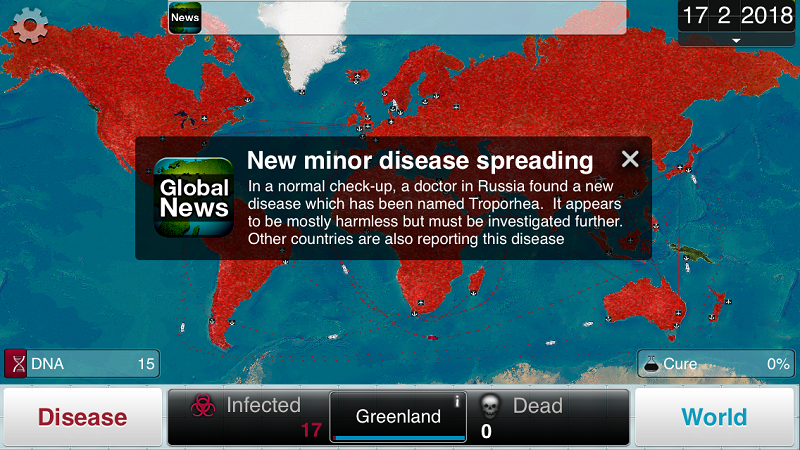 Plague Inc. puts you in the role of a particularly novel villain: You’re a disease, as the name suggests. Your goal is to infect the entire human race and eliminate the species from the planet before doctors and scientists can research and distribute a cure for the global pandemic. Wipe out all human life, and you are rewarded with new game modes and buffs that let you, for example, play as a virus or a fungus rather than a lowly bacterium. This misanthropic ambition turns out to be a wildly popular one: On Monday morning, the top three paid apps in the iOS store were an ad blocker, Minecraft, and Plague Inc. The game has been riding high in the charts since 2012, when it was the 15th-most downloaded game of the year in the App Store. A version for Xbox One went on sale last week. Plague Inc. is not the world’s most amazing game. I’ve been playing it for an hour or two a day since Monday, and I’m probably not going to play much more. Even so, its designer, James Vaughan, has achieved something remarkable by designing a game that feels both transgressively thrilling and educational. When the game begins, you choose which country Patient Zero will live in, but after that, your tools are indirect. You use “DNA points,” which more or less accrue as the disease infects more people, to mutate new abilities—developing antibiotic resistance, say, or becoming transmissible by blood-to-blood contact, or inducing symptoms like coughing, sneezing, and vomiting—that help you stay ahead of the putatively heroic medical researchers who want to stop you. Plague Inc. is appealingly simple. The main interface is a map of the earth that charts your disease’s (your?) progress. Red dots spread as you infect more and more people. Planes and ships turn red as you evolve to survive long journeys. When you infect a new country (although, as with Risk, not every country is represented; Plague Inc. includes “countries” like “Central Africa”), an icon appears that gives you more DNA points if you tap it. One scoreboard-like counter tabulates the number of people you have infected. Another one amasses the number you have killed. You can track each total for specific countries or for the whole world. News flashes inform you when you have attained a new status: more infectious than tuberculosis, HIV, or the common cold; deadlier than the Spanish flu, smallpox, or the Black Death. There’s a sense of humor in some of these, as well as in the achievements. Evolving the symptoms of diarrhea and insanity in one disease gets you a “Brown Streets” badge for public defecation. The systems in the game are not always transparent. You quickly pile up DNA points during the early stages of a new disease, even when only a few dozen people are infected. Once billions of people have come down with a case of the yous, the DNA points seem to stop growing altogether. Tapping a blue “cure” bubble is supposed to slow the doctors working to stop you, but if it does, it’s hard to tell. Global events—like a nation falling into anarchy and ceasing its medical research—also occur with seemingly minimal effect on your progress, or that of your goody two-shoes nemeses. A couple years ago, the federal Centers for Disease Control and Prevention invited James Vaughan to talk to its staff about the game and how he designed it. He conceded to being inspired by a Flash game, Pandemic 2. The critic Simon Parkin wrote that Plague Inc. is a “near exact clone” of Pandemic 2.5, but added that Plague Inc. is also “unquestionably the better game,” with an improved tutorial, a prettier interface, and other minor improvements. Maybe Plague Inc.’s success can be interpreted, then, as an unintentional statement about game development. Here we have a clone that used a few design points to mutate and evolve Pandemic 2.5 into an irresistible global virus. A lifesaving simulator, about the work of the doctors and researchers working to eradicate disease, would probably have been a dud. A murder simulator, about working methodically and without remorse to kill one person, or a small neighborhood of people, might have been a scandal. An extinction simulator, though? That’s not just a hit, but a virtuous one.